The proposals provide for a high degree of self-sufficient energy systems at national level and aim to assure flexibility at neighborhood and user level. It is now up to the Netherlands Environmental Assessment Agency (PBL) to run the numbers behind the proposals and to test them against the intended CO2reduction and costs. In anticipation of the relevant assessment, which is expected at the end of this month, I assume for the purpose of this article, that the proposals as they are, will be implemented. The proposals require an exceptional effort and have enormous implications. It all would be a lot easier if one could start from scratch and design a structure for a CO2and energy-neutral world without having to consider existing sources, investments, capacity, interests and dependencies. The reality is obviously much different, and we must, during the implementation of the Climate Agreement, consider the facts and circumstances of this moment. We want to be able to continue to rely on the current security of supply without the costs of our energy and its distribution soaring. A transfer needs to be made from the current situation, to a completely new system with entirely different starting points, dependencies and requirements on the infrastructure. 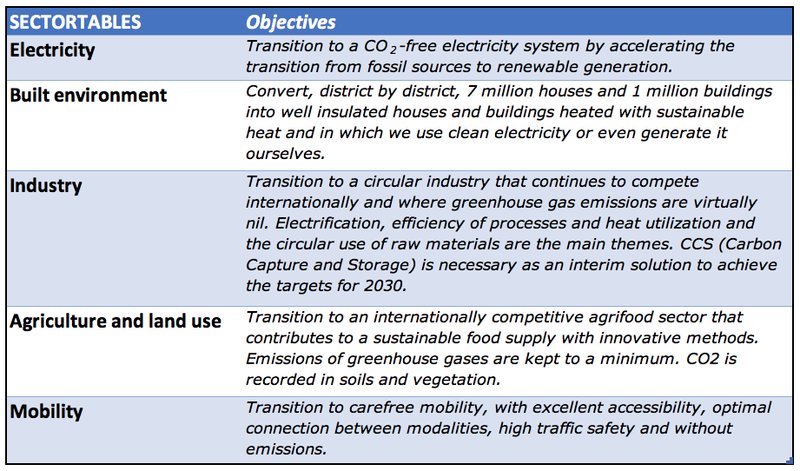 This process is summarized under the name 'energy transition'. New techniques and processes can have an unpredictable influence on the way in which and the sources from which we can meet our energy needs in the future. Examples are the economical and safe production of hydrogen according to the H2Fuel principle developed in the Netherlands, which could be an important step in the sustainable generation, storage and transport of energy. Technological breakthroughs in the field of nuclear fusion seem to make it possible to generate electricity on a commercial basis within 15 years. With today's knowledge, we have to set up a structure that meets the possibilities and challenges of 2050 and beyond. It is precisely this aspect makes the challenge of making our society CO2neutral so complex. What if the cliché that has been circulating since the 1950s 'that nuclear fusion is 20 years away, and always will be', just proves to be true? We can simply not afford to wait any longer for the future, given the finiteness of fossil fuel stocks as well as the societal challenges and meteorological risks that the ever-increasing CO2 emissions are expected to bring. Fortunately, for a large part of the necessary adjustments, that is not necessary. A number of issues are beyond discussion. We want to convert our society into a sustainable environment based on CO2 neutrality. This implies that in time fossil fuels such as gas, coal, oil, etc. will disappear from our energy mix and will be replaced by other, but sustainable, energy carriers. It is also certain that the time in which this transition must take place is limited. It cannot all be done at the same time, but there is a clear need for urgency. This requires structured and careful planning. An important point of attention is that our current low-voltage network (the closest capillaries of our energy network that lies between the transformer stations in the districts and the end-users living or established there) was laid out at the time with totally different principles and requirements than are currently needed to make the energy transition possible. Where gas used to heat the residential heating system and the stove, petrol or diesel fueled our cars, these forms of energy will disappear in the future and electricity will have to take their place. Heating, stove and cars will have to be fed from the mains instead of by gas and oil. Since this increased capacity demand can only be partially absorbed by residential solar panels or insulating measures (insulated glazing, floors and walls), the burden on the (low) voltage grid will increase. This is especially true at peak times: in the morning when people get up (showering, heating on) and in the early evening when people come home from work (car on charging station, cooking, heating on). There will be peak loads that the current network cannot handle. The expectation is that the security of supply that is now virtually 100% in The Netherlands will come under pressure without further measures. It is clear that additional investments are necessary. For example, depending on the degree of energy transition in 2030, according to ‘Netbeheer Nederland’ (the Dutch association of energy grid operators), between € 40 and € 80 billions of extra net investments will be needed to be able to absorb the extra burden on the grid at peak times. Another factor here is that the production of solar and wind energy is not constant and unpredictable and that in the event of overproduction generated energy must also be able to be returned to the grid. No neighborhood is the same and the energy mix and need will also vary from district to district. There are neighborhoods that have been built for 100% sustainable, but also neighborhoods where old buildings have the upper hand and where sustainability is (still) not standard. There are neighborhoods that lend themselves to large-scale solar panel and/or heat pump use, and neighborhoods where this will not be effective at all. The same applies to charging stations for electric cars, batteries for storing residual electricity, etc. In order to be able to take all these aspects into account, the future-proof energy infrastructure will have to be flexible enough to deal with the specific characteristics of a neighborhood. There will have to be direction per neighborhood in order to find the best solution for that district in which the highest security of supply is realized at the lowest possible cost. A complicating factor is that different studies work with different starting points and therefore result in deviating prognoses of the costs associated with the energy transition. This makes it difficult to get a good understanding of what to expect in this regard in future. For example, the PBL states in a report published on 26 April that the costs of the energy transition in 2030 will be somewhere between € 2 and over € 3 billions per year. Eric Wiebes, the Minister of Economic Affairs and Climate, spoke about 0.5% of the GDP per year extra costs (which is about € 4 billion/year) and a report from Netbeheer Nederland (in Dutch) indicates that by 2050 the total cost of the energy supply (depending on the chosen scenario) will be between € 50 and € 60 billions, compared to € 30 billions now. Although this last number includes the costs of the energy itself, which, according to the report, in the case of an unchanged policy in 2050 will be nearly € 30 billion higher than now. However, it turns out that if we calculate the current level of the total energy supply costs (€ 30 billion / year) under the different scenarios to its forecasted cost level in 2050, the cost increase - despite the enormous efforts that the energy transition entails – may actually be ‘less than expected’. Depending on the chosen scenario, the annual average increase is between 1.7% and 2.1%. However, a warning is in order here. Given previous experiences with large-scale government projects, one should not be surprised if the final costs are (significantly) higher. Social consensus is an important condition for obtaining broad support and under those circumstances it does not help to come up with sky-high but realistic estimates at the start of this huge and very important project. The basis of the various cost estimates is different and lack transparency. As such it is difficult to get a well-founded direction of the additional costs that the energy transition entails. At the same time, we need to be realistic and accept that the social importance of the energy transition is such that it is impossible to avoid making necessary but sizable costs to realize CO2neutrality for future generations and being self-sufficient in our energy needs. In every new social movement - and the pursuit of a CO2-neutral planet certainly falls into that category, you have 'first movers', those who see the importance of the required action and are prepared to invest in it. These can be idealistic collectives, but also - often wealthier - individuals who invest in making their homes sustainable, support solar and wind energy or use electric cars. The fact is that the large mass is lagging behind. Either because the financial support to embrace this movement is lacking, or the problem is not yet acknowledged as sufficiently acute or because they are awaiting solutions (technical, structural and capacity-related) that are proven, scalable and affordable. This is one of the major challenges of the energy transition: creating popular support for the required efforts and then generating a feeling among citizens that they do not want to be left out when opportunities arise for implementing the necessary adjustments for their situation. It is precisely this aspect of 'seduction' about which there is little agreement. In itself that is understandable in this phase of the process. First the what, then comes the how. Yet we can’t and shouldn’t separate the one from the other. Without full participation by citizens / users, the intended goal will not be realized. It should be clear to them that they are not alone on this journey, but at the same time be made aware that not participating is not an option. This requires a careful 'carrot and stick' approach. The general interest is leading in this: stimulating where possible and punishing where necessary. A prerequisite for being punished must be that only after affordable and adequate facilities have been offered and loans be made available, one can be subjected to additional financial burdens/penalties. The proposals for the main features of a future-proof Dutch climate policy provide for a self-sufficient system of energy supply. This means that in principle the dependence on foreign energy sources will be limited as much as possible. This seems to me a sensible and responsible objective. This is not the cheapest option but reduces the dependence on systems that we do not control and places the responsibility for CO2 reduction where it belongs: with us. A crucial task for the government is to carefully explain the considerations that have led to this approach, communicate transparently about the progress (even if it falls short of expectations) and thereby create support for the choice made. In order to keep the costs within bounds, it is necessary that there is good coordination between what is possible at national level (in principle the least expensive option, with a strong emphasis on offshore wind) and - having regard to district-specific aspects – what works best at regional level (solar panels and geothermal systems). If this alignment is less than optimal, this leads to competence problems, duplications and cost overruns. This is would seriously erode the support for this operation. The cheapest heat and cooling is that which you do not have to generate. The importance of adequate insulation can therefore not be emphasized enough. Especially homes and buildings from before 1995 have yet to make a difference. Abandoning gas as a source of heat in the built environment will necessarily have to lead to investments in sustainable alternatives. The sector table Built environment believes that a neighborhood-oriented approach offers the best direction management by municipalities and interaction with residents/users, and this direction and interaction results in a so-called ‘transition vision’ of the municipality. It raises the question of whether it is wise to wait for this transition vision, or whether to aim individually for a solution tailored to your home. The advantage of waiting for the transition vision of your municipality is that you take probably may take advantage of the economies of scale of the joint tender, the use and maintenance of the offered solution. It is also conceivable that the financing of such a solution can take place under more favorable (subsidized?) conditions. The disadvantage is that there is dependence on the desired time schedule (what if your neighborhood is scheduled to transition only in 2028?) and customization may become more difficult. This is a difficult choice for the citizen in which expert advice and fact-based information play an important role. This implies that once the process of energy transition is started, the goals should not be shifted anymore. Financing can also come into play. The sector table talks about building-related financing, the costs of which shouldn’t exceed the savings on the energy bill as a result of the sustainable source of energy. If, in the same area, there are other houses/buildings available that have been preserved by the owner's own initiative, which meet the sustainability standards, and which are not burdened with building-related finance, building-related financing will in principle become a value-reducing factor on the value of the property. Ultimately, the conditions of the relevant financing determine to what extent that will be the case. It is difficult to understand that the 'Built Environment' sector table advocates that the price of gas should increase (plus 5.5 cents/m3 rising to 20 cents/m3) in the short term (2020)) in favor of electricity (minus 2.7 cents/kWh further decreasing to 7.34 cents/kWh). This is incomprehensible in the light of the desired neighborhood-oriented approach by municipalities. An increase in the price of gas without being able to offer a collective approach to the transition to electricity in a neighborhood does not seem fair to me and it drives users with a smaller wallet at costs that, for them, particularly if they are tenants, are difficult to escape. This also undermines support for this important operation and creates unrest among users. A tenant has no influence over the quality of the insulation facilities and/or sustainable heating facilities of his home. For this reason, I think that the system should provide for a sanction aimed at the owner of the home rather than on the consumption of energy by users. This sanction should consist of a substantial surcharge on the real estate tax of the building if its energy label does not meet the standard set for that building within the framework of the transition vision, after collective provisions have been offered for the transition in question. A more stringent regime could apply to housing corporations and larger owners associations, since scale allows the independent implementation of the necessary transition and the general interest is best served by realizing volume as quickly as possible. Apart from building-related measures, consumer behavior can also be controlled. This can be started immediately. Examples are energy-related cost-increasing taxes on energy-inefficient cars, electrical appliances and facilities. The energy tax can also be made dependent on the level of consumption. Where the consumption supersedes the average value within the neighborhood concerned, surcharges can be applied to the energy tax due, depending on the energy label of the dwelling/building. This establishes a progressive relationship between excessive consumption and the associated costs. Smart energy meters must make it possible to take account of specific durability promoting devices such as electric cars and heat pumps and the like. As consumption in the neighborhood decreases, the surcharges are adapted to the changing circumstances and the pressure is increased to control excess energy consumption. If the PBL has evaluated the proposals and made their recommendations, it is up to the politicians to translate the proposals together with the results of the calculations and recommendations of the PBL into policy and actions. We have to keep our fingers crossed that the existing broad political support will be maintained, even if the results of the onward calculations are disappointing and the proposals need to be adapted. All stakeholders in the energy transition need clear and reliable policy, continuity and certainty about the consequences of the choices made. Politics is an important factor in this process and is primarily responsible for creating and maintaining the popular support for it. Sadly, this may become more and more difficult in the current environment of political opportunism, partisan interests and/or political framing process. As such politicians should be extremely careful not to become the weakest and least reliable link in the important process of the energy transition. Newer:General Government Performance Index 2018: The political center is paying the price for good government policyOlder:Would the Catholic Church qualify as a criminal organization?